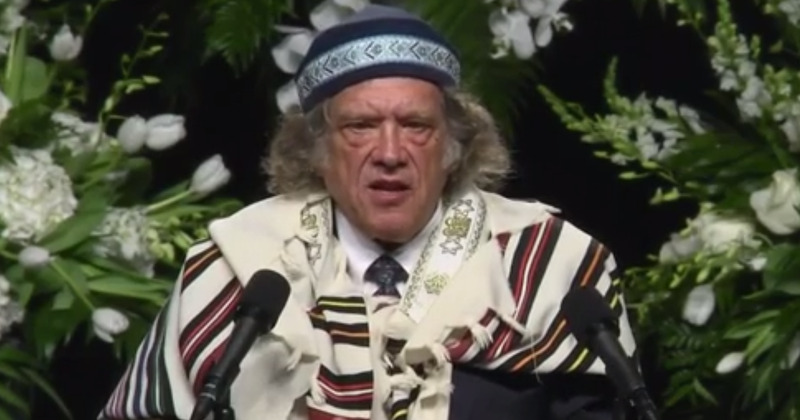 Screenshot/CBSRabbi Michael Lerner delivers a eulogy for Muhammad Ali at Ali’s funeral on Friday. Rabbi Michael Lerner delivered a powerful eulogy for boxing legend Muhammad Ali at his funeral on Friday, praising Ali for daring “to love black people at a time when black people had a hard time loving themselves” and calling for an end to Islamophobia. Thousands of friends, family, celebrities, and political figures attended Ali’s traditional Muslim memorial service in Louisville, Kentucky, which spanned more than two days. Ali died last week at 74 from complications related to his Parkinson’s disease. “Muhammad Ali had the courage to say no to Farrakhan and leave the anti-Semitism and homophobia of that part of Islam, and eventually to draw sustenance from the Sufi approach to Islam — the ultimate in a love-oriented religion,” Lerner said, according to a transcript of the eulogy provided to Israeli news outlet Haaretz in advance of the funeral. “If Muhammad Ali were here today, I’m sure his message would be this: Don’t waste your time on this planet fighting the small battles — put your life energies and money into fundamental systemic transformation,” said Lerner, who is also a political activist and editor of the Jewish magazine Tikkun. Lerner said that what made Ali a hero was his courage to stand up to the “immoral” war in Vietnam by proclaiming himself a conscientious objector. Lerner was an anti-war activist along with Ali, who refused to serve in the US army and was immediately stripped of his heavyweight title in 1967. “Knowing he would lose his title, knowing he would face the racism of American society that would be heaped upon him for saying no to the crazy war in Vietnam,” Ali said no to the war, Lerner said. “He spoke truth to power — we must speak truth to power,” he added. I just got his name. Rabbi Michael Lerner. One word for this man. RESPECT. rabbi lerner, you my hero today. We Jews, as well as our non-Jewish allies in all religions and secular humanists, wish to pay honour to the Muslims of the world as they continue today the fast of Ramadan, and join with them in mourning the loss and celebrating the life of Muhammad Ali, a great fighter for justice and peace.